In preparation of the WikiLeaks video posting of a fatal U.S. helicopter attack, you worked in a so-called bunker in Iceland. How was your prep work done this time? We had a bunker in the Guardian offices where we  [including] Guardian, New York Times and Der Spiegel reporters  were. It wasn't quite as aesthetically pleasing as the one in Iceland, but we did get a lot of work done. There have been reports about your evasive measures, with regard to surveillance. Can you describe those? We have ongoing security concerns in relation to surveillance. The U.K. is quite an aggressive surveillance state, but it is also liberal  while it likes to surveil people, it doesn't tend to arrest them. We can't describe our security procedures in relation to surveillance for obvious reasons, but there has been a step-up in surveillance activities against us in the past two months. Not yet, because that would reveal which ones we have seen and which we have not. But we have noticed many concrete things, not just suspicions. Have you been tailed, for example? We assume that sort of thing goes on because we have had proof of that since at least early 1998. We just assume that that happens as part of our work: that we are tailed by private investigators working for big banks or cults we have offended and by state intelligence organizations. Some commentators have described you as anarchic. You have to be careful. The Daily Mail is a London tabloid. So you believe in government, just open government? There cannot be good governance without good information given to good people. It's impossible in a democracy. Physicists [Assange was trained at the University of Melbourne in physics] look at extreme circumstances to understand a situation. The extreme situation of ignorance would be if everyone were deaf, dumb and blind tomorrow. [Nobody could] communicate. Every form of society would collapse in an instant  democracies, monarchies and dictatorships alike. But if we look in the other direction and ask what if we maximize the reliable, verified information about how the world is working, then we start to produce more sophisticated and intelligent structures that respond to the abuses in societies and also the opportunities there may be in society. It's a combination of personal temperament and specific skills and opportunity. My personal temperament is that I like protecting victims and I like to engage in intellectual combat. In terms of personal skills, early on I became interested in cryptography: I became a cryptographic engineer, and I became involved in free speech. I set up one of the first free-speech ISPs [Internet service providers] in Australia. That combination of skills has proved coincidentally extremely effective in what WikiLeaks does in terms of protecting people, using encryption technology and being engaged in political and policy debate and producing information that will push reforms. Any idea how that personal temperament developed? In the East Coast of the U.S., there's a desire to perceive everything as coming from the childhood  probably due to the popularity of Freudian psychology. I don't see things that way. Personal temperament is genetic. It's there from when you are a child because it's your shuffle of genes  maybe environment draws it out a bit  but I'm just an amalgam of the genes of my parents. Do you feel that no one's security will be threatened by the publication of this material? The Kenyan government. The suspension of the Prime Minister of Tanzania. We published a corruption report. The Daily Mail said you would have made public information about the D-Day invasion if it had fallen into your hands. Is that true? That's just nonsense. We have a standardized policy of "harm minimization." I believe we are the only media organization that has a [clearly stated] public policy about the materials that we will accept. If we take a case on, then we do it. We don't do things ad hoc. We communicate entirely the material our whistle-blowers give us to the public. We may go through a harm-minimization process that delays publication while people are notified. In the example of Operation Overlord [World War II's D-Day], we would have delayed and notified the authorities. What is to come from the 15,000 documents that you plan to release later? Some may be more explosive. They are intelligence reports, so [they] come from a little higher level. A lot comes from informers, so they are hard to read sometimes, or they are trying to rat out a family enemy. War causes people to inform on one another  it's the corrupting influence of war. A family informs on its enemy, the U.S. kicks down the door the next day, and there may be shooting because of the raids. That sort of material may be in there. Is it true you travel only with a computer, backpack and change of socks? No, we have a lot of gear. We put together a strong journalistic team to study this material, but there are 90,000 reports. Our groups  the New York Times, Der Spiegel, the Guardian and WikiLeaks  covered about 2,000 reports in detail. The vast majority of this material is going to require soldiers who were there to have a look at it. It's going to require Afghan refugees to take a look at it. It's going to require computer programmers and statisticians to take a look at it. We call on the general public to come forward and go to wardiaries.wikileaks.org and tell the local press what you see and tell your local friends what you see. 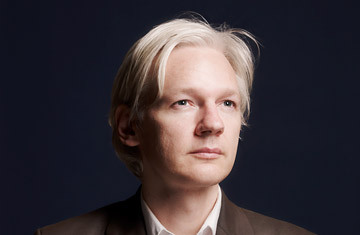 Read "WikiLeaks Founder: I Don't Know Source of Afghan Leak."